Political prisoner is a deviant, few observe. A political prisoner is jailed for “freely expressing” any disagreement, no matter how tranquilly. She/he is also jailed for disobeying the mainstream definition of acceptable “social behavior” as constituted by the government. She/he can also be “legally” arrested for belonging to an organization, race, or social group unapproved by the “democratic” government. It will be wrong to uphold “violent” political prisoners because they are naturally violating the axioms of self-ownership that are the basis for freedom and peace. The non-aggression principle (NAP) is such a maxim, and it is the idea that each person has the right to make his or her own choices in life so long as they do not involve aggression (defined as the initiation of force or fraud against others). The principle asserts that aggression includes any encroachment on another person’s life, liberty, or justly acquired property, or an attempt to obtain from another via deceit what could not be consensually obtained, and so is always illegitimate. In the current scenario, the kind can be assessed to “direct violence” and “indirect violence” daily. Direct violence is an offensive crime committed by the political prisoners and is unjustified. However, the State cunningly tags it as a defensive measure when committing direct violence in conflict like the “war on terror” or “war on drugs” or “war on naxals” or the kind of war being carried out against the insurgence of NE states particulalrly in the state of Manipur. At present in Manipur prison, a total of 25 persons are being detained under NSA. Altogether 623 prisoners are detained in the Manipur Central jail among which only 42 are convicted(as on Nov. 2015). This means trials for the remaining prisoners are still underway and the police is still yet to file any charge sheet. This prisoners may have some excessive activities most of them are detain just because they fight with an ideology. The central government and various state governments of India are so worried about their activities that it is unthinkable that they can remain free and making them rot in jail for year after year has become a mainstay of state policy. The general public mostly remains ignorant about these people, and the government’s efforts are constantly directed towards maintaining that ignorance. Sometimes, some news appears about them, hidden in the inside pages of newspapers and soon fading out of public memory. The only people concerned about these prisoners are a few human rights organizations and activists, some political organizations, and their hapless relatives who hope that, one day, their near and dear ones will again breathe in free air. It is unprecedented, in recent history, for such a large number of people accused of political offences to be imprisoned for such prolonged periods of time by a State which claims to be democratic and which is (officially) not at war. The central government and various state governments of India constantly try to obscure the difference between political offences and criminal offences, so that the usual public sympathy towards political prisoners can be suppressed and it becomes easier to harshen the conditions and sentences of the political prisoners. For this reason the Indian State promulgates a series of laws which, although nominally supposed to control or prevent organized crime or terrorism, practically become the main weapons in the hands of governments to suppress the slightest political dissent. 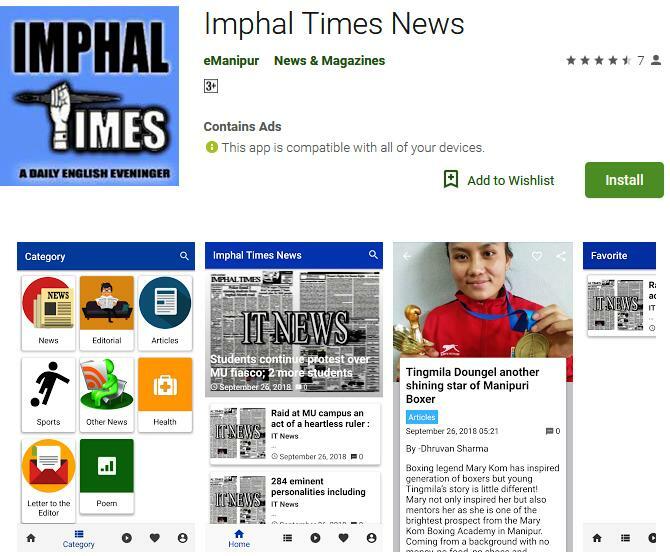 By all these standards, We the Imphal Times can be charged under 124 (a) of Sedition Act in India for boldly expressing our views in defense of liberty and nonviolent political prisoners. So, how free is our freedom?